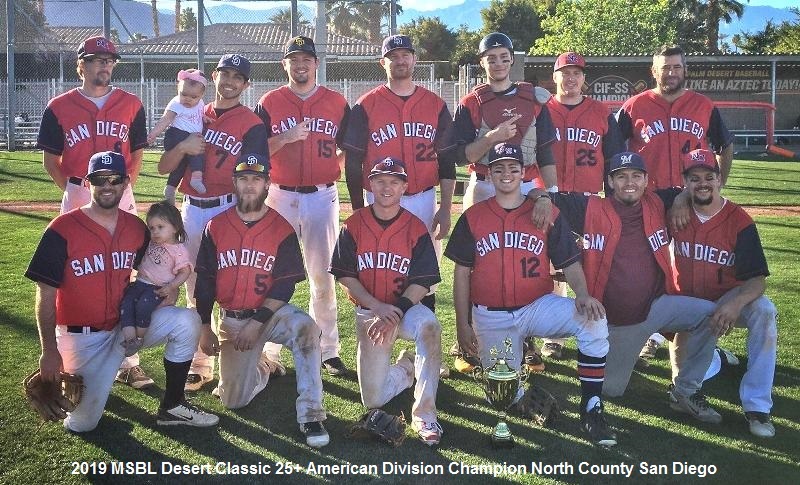 North County San Diego (NCSD) defeated the Inland NW Bandits 6-4 to claim the 2019 Desert Classic Championship in the 25 and over American Division. NCSD fell behind early as the Inland NW Bandits scored a run in the first inning after NCSD starting pitcher, Daniel Garcia, gave up three walks, one with the bases loaded. NCSD responded in the top of the second inning to tie the game, 1-1. Christian Florido led off with a walk and was moved into scoring position after an errant pickoff throw. Eric Peterson then drove in Florido with a single. Daniel Garcia settled down over the next four innings, giving up only three hits while striking out six. NCSD had their biggest run-producing inning in the fourth with three runs scoring after singles by Tommy Hays, Ben Penney, Christian Florido, Eric Peterson and Andrew Zier. NCSD pushed the lead to 5-1 in the fifth inning when Mike Buttenob scored on a sacrifice fly by Patrick Fyfe. The Inland NW Bandits answered back in the bottom of the sixth with two runs on three hits and a sacrifice fly to cut the NCSD lead to 5-3. NCSD responded in the seventh inning with a run scoring on a bases loaded walk. The 6-3 lead was taken into the bottom of the ninth inning as Daniel Garcia quickly recorded the first two outs but gave up a two out single. The next Bandits batter tripled in a run to cut the lead to 6-4. After a walk put runners on first and third, NCSD ended the game as catcher Jake Gerardi gunned down the Bandits attempted base stealer at second base. Daniel Garcia threw a complete game, giving up 4 runs (3 earned) with nine strikeouts. Eric Peterson paced the NCSD offense going 3 for 4 with two RBI’s.